How do I stop my son from constantly biting my daughter? Put a single finger on his lips to emphasize the scene of the crime. Comfort the victim, pointing out how she is hurting and feels bad. Offer alternatives for getting a turn with the doll. Try to determine whether the biting tends to recur in certain situations or at certain times of the day. Change the routine during those times—perhaps move bath time into that slot, or serve a predinner snack. The good news is that as your twins learn to control their aggression, their struggles will become increasingly verbal rather than physical. Should I potty train at the same time or separately? It is quite likely that twins will not reach potty readiness at the same time. If this is the case, resist the temptation to make a big deal of the difference. Be matter-of-fact and accepting. The trick is to wait until each one is truly ready and eager to start the learning process. There is no greater waste of precious energy than trying to toilet train multiples who are not ready and motivated, so hurrying them is definitely inadvisable. Once they get started, twins often master this developmental milestone sooner than single children because they have each other to observe and learn from. Try to begin the process when they are enjoying doing things together and copying each other rather than fighting and competing. They are able to understand and follow simple directions involving two or three steps. They have reached an emotional stage where they wish to please and cooperate. Don’t start training at the height of temper tantrums, the no stage, or during a time of unusual stress or changes in family life. They are physiologically ready to control their bowel movements—they know what it feels like to go and recognize the sensations of elimination. How do I overcome the lumping of my identical boys as “the twins”? 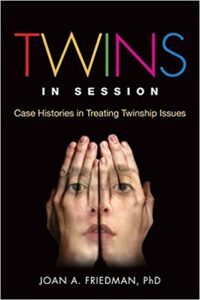 I understand your struggles with the “outside world” lumping your sons as “the twins.” You are not alone in attempting to figure out how to manage people’s perceptions and stereotypes about being a twin. You and your husband are well ahead of the game because you are addressing this dilemma sooner rather than later. I hope it will be reassuring for you to know that your family’s attitude and parenting decisions will have the most impact on your sons’ burgeoning identities. When you talk with others about your children, use their names and present them as individuals. Make individual eye contact with each child while speaking to him or her. When you describe your children, refer to their positive qualities; avoid labels that lock them into positive or negative stereotypes. Give each child individual ownership of toys and clothes. Bond with each child as an individual, even when you are caring for both of them. Capitalize on opportunities for spending alone time with each of your children, and create more of these opportunities as each child matures. Compare your children’s development with their peer group instead of each other. If you have more questions, please leave them in the comments section. I would love to hear from you. The image in the post is in the public domain courtesy of Public Domain Pictures.